With nectar now readily available year-round, Israeli bees are increasing their honey production. Israel may be a desert, going six months of the year without rain, but local bee populations are thriving and honey production rising thanks to a new flowering tree brought over from Australia. It’s not a good time for honeybee populations worldwide. All over the globe bee numbers are dwindling, as hives are hit by Colony Collapse Disorder – an ailment which an Israeli company, Beeologics, claims to have now developed a vaccination for. Last winter alone, more than 36 percent of the US bee colonies collapsed, affecting honey production, and the one-third of all food production that requires pollination – from fruits and nuts to the dairy and beef cows that feed on alfalfa. Israel has 450 beekeepers in the country, who manufacture 3,600 tons of honey annually for growing local consumption and for export. Like in many desert countries around the world, Israel’s beekeepers face difficulties because the majority of native plants and flowers blossom only once a year after the winter rains. “Most of Israel’s trees and shrubs flower in the spring,” David Brand, chief forester and head of the forest department at the Keren Kayemeth Leyisrael-Jewish National Fund (KKL-JNF), tells ISRAEL21c. This means that in other seasons, hungry bees have to be fed sugar solutions or transported to parts of the country where flowers are still in bloom – both expensive and messy propositions for apiaries. The KKL-JNF began introducing a variety of the species to Israel 12 years ago. “We started with the seeds and seedlings, and established trial plots all over Israel to investigate which species were suitable” for Israel’s climate, says Brand. “We also tested those trees to see whether or not – although they had wonderful flowers, etc., – the bees would be attracted to them,” Brand adds. After two years of extensive trial and error testing at KKL-JNF nurseries nationwide, Brand and Aizikovich found the right plant and bees began to pollinate the flowers while collecting nectar to be made into honey. “Mega-producing” Eucalyptus trees from Australia bloom all year round. Since then over 100,000 trees have been distributed annually to beekeepers every year – a total of one million trees over the last 10 years. Distributed as seedlings, these trees are still young, but already beekeepers are noticing the difference, with many now leaving their hives near newly planted groves for much of the year instead of following wild flower blossom. Among those imported seedlings found to be the most sweetly successful in the effort are a variety of Eucalyptus trees, particularly lemon-flowered mallee, coral gum, hybrid gum and red-capped gum, grown in regional KKL-JNF nurseries. The trees – which are also a source of high-quality wood – are good shade-providers, which Kandal says is important, since the hives could be left under the trees, whose shade provides the right temperature for optimum honey-production by the bees. This also means that the hives won’t have to be moved periodically, which is currently the case. The availability of the new trees has also brought some former farmers back to agriculture, Kandal reports. Local species have also been included in the effort, with a type of carob tree found in the Israel’s south that produces many flowers and attracts many bees. “So we propagated this tree and then produced seedlings,” along with other Israeli indigenous bushes like rosemary that were included in the project,” Brand continues. The project is now attracting interest from nearby Jordan, where one beekeeper received 20,000 samples of the new species two years ago. Interest is likely from other countries too as desertification and drought forces more beekeepers around the world to combat similar problems to those of apiarists in Israel. They tree have already put a sweet smile on the face of Israeli beekeepers like Yehuda Kandal, who has 250 hives producing five tons of honey a year. 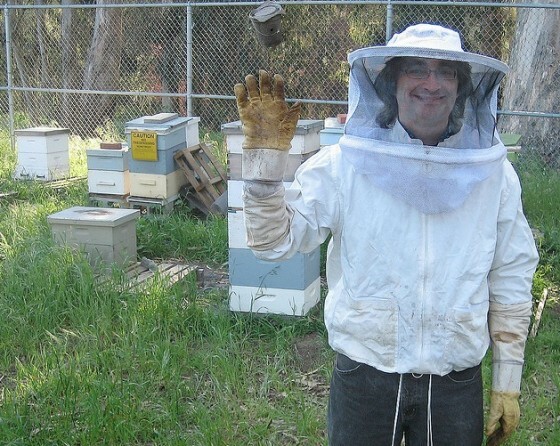 He calls the trees a “major contribution” to the important honey-production sector. I think you are getting mixed up because of the old myth that Eucalpytus trees magically drained the swamps by sucking up all the water. (In fact it was the back-breaking work of digging drainage channels carried out by the Jewish pioneers that did that. Eucalyptus trees can in fact withstand long periods of draught – remember they came originally from Australia. Proof can be found all over Israel where the original trees still flourish and many new ones have sprung up from seed with absolutely no help from man at all. By the way, Israel recycles 70% of its water – leading the world. The next best is Spain with 12%. So of all countries, you do not need to worry about Israel being spendthrift with our precious water supplies.